Some well-informed people are convinced that we humans are our most dreaded foe, unknowingly of course. I tend to agree, as did Pogo, a possum cartoon character created by Walt Kelly in 1948. The long-running popular comic strip featured humorous anthropomorphic animal characters that inhabited the Okefenokee Swamp, an actual national wildlife refuge located on the Florida-Georgia border. The strip often engaged in social and political satire through the adventures of the many animal characters. 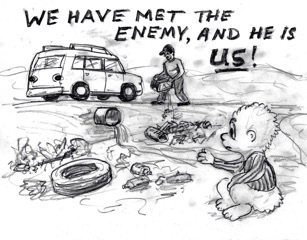 For example, the above cartoon depicts the drainage of polluted water and careless disposed of trash, some typical human waste products. In this case, the saying “As you make your bed, so must you lie in it” might be paraphrased this way: “As you consume and discard more stuff, so must you live and deal with it.” And deal with it we must. The first article in the Views section addresses the mutually reinforcing economic philosophies of Pogo and Pope Francis. Both raise concerns about excessive materialistic consumerism, and both favor economic initiatives that are locally based, cooperatively formed, environmentally friendly, and long-term sustainable. The author, David MacLeod, provides substantive rationale for developing an economic system that coincides with integral permaculture. The Integral Permaculture Academy (http://www.integralpermaculture.org) defines integral permaculture as a design practice based on a holistic and ethical science that includes all levels of experience—internal and external, individual and collective, ancient and modern—united into a coherent and systemic whole, with the sole purpose of designing healthy and sustainable cultures and environments for all species. I don’t know about you, but the concept of integral permaculture sounds reasonable, equitable, and practical to me, especially given the imperative of our making some fundamental adjustments in our socio-economic-political systems—if we wish to create a worldwide sustainable existence on this planet. Most articles included in Views address areas related to the theme of pogonomics and pope-onomics. Economic concerns are voiced by Chris Martenson, who warns of deflation ahead, Charles Hughes Smith, who warns of a “echo housing bubble” (see News), and Gail Tverberg, who predicts that low-priced oil will cause slower economic growth. Danny Chivers adds weight to these predictions by reminding us that producing large quantities of renewable technologies will require using huge amounts of resources, many of which are rare, expensive, and hard to extract. Charles Eisenstein, in a podcast interview with Chris Martenson, reminds us that genuine wealth is not measured in material terms alone, and Margaret Klein Salamon makes a strong case for the whole of humanity to mobilize in undertaking the essential collaborative steps needed to mitigate and, hopefully, avert future climatic catastrophes. Salamon’s plea is reinforced in a new film inspired by Naomi Keln’s book, “This Changes Everything” (see Solutions). > Integral Permaculture: Pogonomics And Pope-Onomics (David MacLeod). In the 1980s, Joe Dominguez began framing his teaching around what he called “Pogonomics.” In a 1990 column on the subject “What is Enough?” Dominguez wrote, “While no one was paying much attention, economics replaced religion as the touchstone of human life. Like religion, economics has priests and rituals. The purpose of these priests and rituals is to interpret the meaning of events while keeping the people in confusion. Any effort on the part of the masses to connect directly with the realities behind the rituals is considered a sacrilege”. In contrast, pope-onomics encourages self-governing economies and cooperative enterprise, which are owned and controlled by the people who depend on them (workers and customers), and are not set up to maximize profits. Co-operatives have a long tradition in the catholic tradition and indeed in the very roots of the very earliest Christians. > Peak Prosperity: Deflation Warning: The Next Wave (Chris Martenson). The signs of deflation are now flashing all over the globe. In our estimation, the possibility of an associated financial crisis is now dangerously high over the next few months. Lots of people are woefully unprepared for what’s coming next. For many it will be a shock. Not because they couldn’t see it coming years in advance and made their own mental and financial adjustments on their own terms, but because they wouldn’t. Preferring to avoid an unpleasant truth they put it out of sight and out of mind, hoping that somehow things would work out in their favor. > Our Finite World: Low Oil Prices – Why Worry? (Gail Tverberg). The Peak Oil story we have been told is wrong. The collapse in oil production comes from oil prices that are too low, not too high. If oil prices or prices of other commodities are too low, production will slow and eventually stop. Growth in the world economy will slow, lowering inflation rates as well as economic growth rates. We encountered this kind of the problem in the 1930s. We seem to be headed in the same direction today. > The New Internationalist: The Stuff Problem (Danny Chivers). The problem with wind turbines, solar panels, ground-source heat pumps and electric cars is that they’re all made of stuff. When people like me make grand announcements (and interactive infographics) explaining how we don’t need to burn fossil fuels because fairly shared renewable energy could give everyone on the planet a good quality of life, this is the bit of the story that often gets missed out. We can’t just pull all this sustainable technology out of the air – it’s made from annoyingly solid materials that need to come from somewhere. > Peak Prosperity: Charles Eisenstein: What Is Wealth? (It’s About So Much More Than Money). This podcast/script features Chris Martenson speaking with Charles Eisenstein at Martenson’s homestead, a model of sustainability. To anyone whose identity is associated with money, the question arises: What happens if your money goes away? Well, then who are you? > Eco Watch: The Emergency Climate Movement (Margaret Klein Salamon). We are living in a state of planetary emergency. To have a chance of averting the collapse of civilization and the destruction of the natural world, we must mobilize our society on the scale of World War II to achieve net zero greenhouse gas emissions at wartime speed. The fact that we have already heated the world to such dangerous levels and show little sign of stopping is evidence of widespread institutional failure. We cannot expect anyone else to save us. We must organize to save ourselves. > Climate Central: Warming May Boost Carbon Storage On Public Lands (Bobby Magill). Public lands are considered one of America’s best defenses against rising greenhouse gas emissions because the forests there pull vast quantities of carbon from the atmosphere and store it in tree trunks and roots. As the climate warms, public lands may become even more valuable in America’s effort to fight greenhouse gas emissions because climate change may increase the amount of carbon federal public lands in the Lower 48 states are able to store by nearly 20 percent by 2050, a new study shows. > AP-NY Times: Despite Pledges, Climate Action Seen Falling Short. With pledges to cut or curb greenhouse gas pollution on the table from all major countries except India, researchers say the world is on track for more than 2 degrees C (4 F) of warming this century. That’s a level that scientists say could result in profound and irreversible impacts on the climate system, including flooding of coastal cities and island nations, disruptions to agriculture and drinking water, and the spread of diseases and the extinction of species. However, climate experts say that it’s not game over yet, as long as the Paris agreement includes ways to step up the pace of emissions cuts over time. > MPR: The Role Food Waste Plays In Climate Change (News Staff). In the U.S. alone, 40 perfect of food never makes it to the table. It’s estimated that we throw away 35 million tons of food every year. Currently, 5 percent of all U.S. greenhouse gas emissions come from food that’s been wasted. In fact, if food waste were a nation, it would be a top emitter of greenhouse gases, just below China and the U.S.
> AP-MPR: After Years Of Low Rates, Customers Can Expect To Pay More For Water. Rates have been shooting up nationwide in drought-stricken states and in cities trying to upgrade their aging infrastructure. Experts say the trend is sure to accelerate as the cost of water, treatment and delivery comes into line with how essential water is to our daily lives. Elected leaders have long fought to maintain cheap rates, but those prices don’t cover the full expense of finding and treating new water sources or upgrading old pumps and pipes. A year ago, the average monthly household water bill was just over $34 based on an average usage of 7,480 gallons, according to a survey conducted by the American Water Works Association. That’s up more than 40 percent since 2008, or $10 per month. > PhysOrg: Price Of Solar Energy In The United States Has Fallen To 5c/Kwh On Average (Lawrence Berkeley National Laboratory). Newer solar projects generate electricity more efficiently. Projects completed in 2013 performed at an average capacity factor of 29.4% (in AC terms) in 2014 – a notable improvement over the 26.3% and 24.5% average 2014 capacity factors realized by projects built in 2012 and 2011, respectively. This improvement among more-recent project vintages is due to a combination of several trends: newer projects have been sited in better solar resource areas on average, and have increasingly oversized the solar collector field and/or employed tracking technology to increase energy capture. > Of Two Minds: The Echo Bubble In Housing Is About To Pop (Charles Hugh Smith). Here’s the knife in the heart of the Echo Housing bubble: declining household income. The Federal Reserve-induced Echo Housing Bubble is finally starting to roll over, and the bubble’s pop won’t be pretty. Why is the bubble finally popping now? All the factors that inflated the Echo Housing bubble are running dry. These include: unprecedented low mortgage rates; FHA mortgage approvals for anyone who fogs a mirror; frantic cash buying by Chinese millionaires desperate to get their money out of China; the Federal Reserve buying up trillions of dollars in mortgages; and lemming-like buying of housing for rentals by everyone from Mom and Pop to huge hedge funds. > Yale-e360: A New Global Tinderbox: The World’s Northern Forests (Ed Struzik). Rapidly rising temperatures, changes in precipitation, and increased lightning strikes are leading to ever-larger wildfires in the northern forests of Alaska, Canada, and Siberia, with potentially severe ecological consequences. These combined areas ring the treeless tundra regions south of the Arctic Circle and easily rival in size the rainforest regions of the world. This massive ecosystem comprises nearly 30 percent of global forest cover. Fire experts agree the fire situation will likely get much worse as rising temperatures, drier conditions, and increasing thunderstorms and lightning strikes lead to more fires burning even bigger, hotter, faster, and deeper into the ground than at any time in recorded history. > Conservation Minnesota: Clean Water Promise. Water connects each of us as Minnesotans and it connects all conservation issues in our state. Because of water’s unique importance, Conservation Minnesota and our Minnesota Waters program is working to achieve a lasting legacy for future generations. We call it the Clean Water Promise. Read the five long-term goals for 2020-2050. > Alternet: Is The Local Economy The Solution To A Post-Capitalist World? (H. L. Onstad). The thrust of Michael Shuman’s book, The Local Economy Solution, by is not about changing the traditional economic development model as much as how to innovate to prosper. The goal should be to “minimize public subsidies and to find the lowest-cost ways of activating and spreading private sector businesses.” With the economy spluttering, hopefully more people will see the value in supporting their favorite local cafes, restaurants and shops at the expense of the chains, and realize that keeping more money in the community helps their friends and neighbors too. Shuman’s book provides insight into the planning and consumer behavior shifts needed to make our cities and towns more resilient, safer and healthier, as well as real-world financial modeling for investing in, or starting a successful local business. There’s no better incentive to be a “pollinator”. > Greenpeace: 100% Renewable Energy By 2050? Why Wait? (Shuk-Wah Chung). A new Greenpeace report shows how the world can move to 100% renewable energy by 2050. The bad news: It needs political will. The good news: Seven signs that give us hope the Energy [R]evolution is already on its way! > The Archdruid Report: Retrotopia: A Change Of Habit (John Michael Greer). This is the fifth installment of an exploration of some of the possible futures using the toolkit of narrative fiction. Our narrator, having arrived in the capital of the Lakeland Republic (from his home in Atlantic Republic), discovers that things are even stranger there than he thought. He exchanges his bio-plastic duds when shopping in Lakeland’s locally owned stores for apparel made of natural materials, fit well, and feel comfortable.